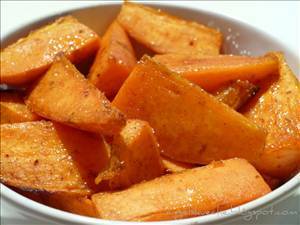 Peel sweet potato and cut into wedges. Toss sweet potato wedges in extra virgin olive oil and garlic pepper. Spray cooking pan with non stick spray. Place in pan and bake at 400 °F (200 °C) for about 40 to 45 minutes. Check sweet potatoes at least once and flip to prevent burning. Remove sweet potatoes and allow to cool and enjoy. I know sweet potatoes are best for me since I am diabetic and when I want potatoes. I will definitely make these part of my menu ... maybe tweek a bit to change up and maybe not. As I have not tried this recipe yet, Sweet Potatoes are very good for you and I can't wait to try it. I will submit my review at that time. Thank you. I agree with beets_yum and dannisidhe. people are doing that on every recipe! BTW, you can't cook flax oil, so I would recommend against that suggestion. sweet potato fries rule!! This recipe is perfectly fine and good for Fat Smash Phase 1. Geez, people. Don't give it low stars just because it doesn't apply to your diet. Just move on and try something else. Sounds great. I will try this soon. Roasted sweet potatoes and black beans with arugula and red potatoes tossed in a red wine vinaigrette. There are 233 calories in 1 serving of Baked Sweet Potato Wedges. Calorie break-down: 52% fat, 45% carbs, 4% protein.